NAHA, OKINAWA PREF. 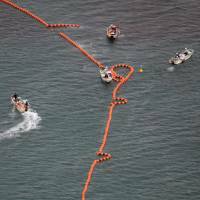 - The Defense Ministry began laying buoys Thursday morning to cordon off a stretch of shoreline in Okinawa set to become the site of a replacement facility for a U.S. Marine base in the prefecture. The move is likely aimed at keeping protesters away from the site as the government starts seabed drilling surveys in preparation for land reclamation work. Many in Okinawa remain opposed to the planned facility in the Henoko district of Nago, calling for the U.S. Marine Corps’ Futenma Air Station, located in a crowded residential area of Ginowan, to be relocated outside of Okinawa. “The strong-handed move to start the surveys for land reclamation work without fully informing the locals, and before a sufficient environmental assessment is conducted, tramples on the basic rights of people and the rich biodiversity of the area,” the mayor said. The buoys will be fully installed within a week, according to Defense Ministry officials. Trespassing in the restricted zone will be a criminal offense under the Japan-U.S. Status of Forces Agreement, which governs the use of the U.S. military bases in Japan. Opponents of the replacement facility boarded small boats and canoes early Thursday morning to protest at the site, but were urged to return to the shore by six patrol vessels and several dozen boats of the Japan Coast Guard. The ministry’s Okinawa Defense Bureau conducted drilling surveys for the facility in 2004 but was forced to quit when protesters in boats swarmed around the site. No off-limits areas were set up at that time. 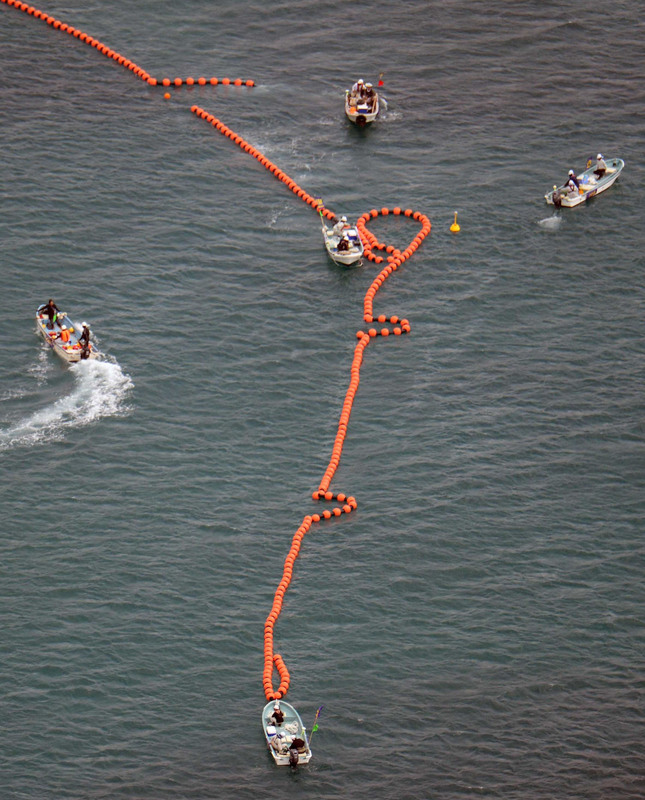 On July 17, the Okinawa prefectural government gave its approval for the drilling surveys to the defense bureau but asked it to explain the process to local fishermen beforehand and to preserve marine resources in the area. The seabed surveys will take place in 21 locations within the area, with the deadline set at Nov. 30. A gubernatorial election is scheduled for November in Okinawa, and the Futenma relocation plan may be set back should an anti-base candidate win the post.